Electronics is approaching its inherent speed limit, but the need and demand for a larger bandwidth is continuously and dramatically increasing. In the framework of signal transport, photonics has already demonstrated its superior performances and now optical interconnections are spread worldwide: information is delivered daily at the home or in the office, thanks to ultrafast optical fiber networks. For this reason the electronic-photonic scientific community works towards the integration of various, fundamental optical functionalities on electronic compatible platforms, pushing electronic systems towards THz-photonics data speeds . However, the success of this approach strongly depends on the availability of efficient methods to monitor the optical data stream “on chip”. To avoid the electronic bottle neck, the information flow has to be ideally characterized in an “all-optical” way, shrinking the actual device size to fit in the electronic friendly microscopic world. It is important to keep in mind that this monitoring must address an optical signal in its whole complex nature, i.e. in both amplitude and phase. The complex character of the electric field in pulses is very often addressed in optics by means of interferometric techniques . In classical holography the whole information on the spatial light distribution is stored by photographing its interference fringes together with a reference field. Likewise, the complex shape of a temporal pulse can be extracted from its beating with a reference pulse. Spectral shared interferometry is a popular method, widely used in both electrical and all optical implementations, which employs as a shifted (sheared) reference replica of the pulse itself in frequency . The resulting interferogram of this self-reference approach enables the unambiguous reconstruction of both the amplitude and the phase of the optical pulse. 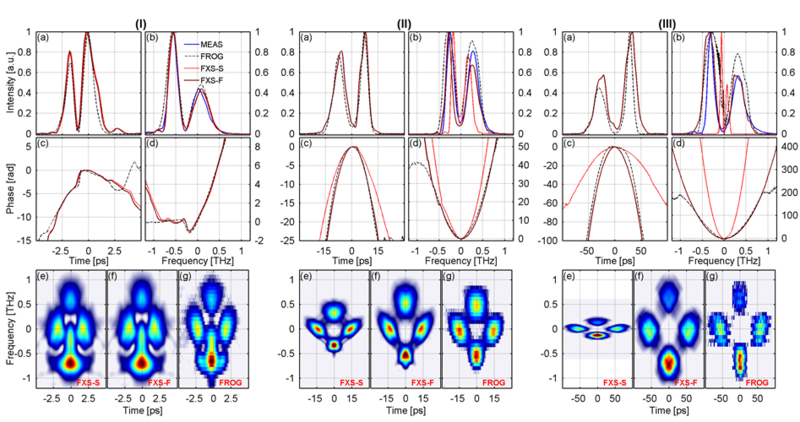 We recently  developed a device capable of characterizing ultrafast optical pulses in their complex nature with the aid of synchronized incoherently-related clock pulses based on a novel variation of Spectral Phase Interferometry for Direct Electric-Field Reconstruction (SPIDER). Our scheme exploits degenerate four-wave-mixing (FWM) in a CMOS compatible chip, and its design is amenable for full “on chip” signal characterization. Previous reports of ultrafast optical signal measurements  in integrated platforms include time-lens temporal imaging on a silicon chip  and waveguide-based Frequency-Resolved Optical Gating (FROG) . Time-lens imaging is phase insensitive while waveguide-based FROG methods require the integration of long tuneable delay lines – still an unsolved challenge. With our method, we measure pulses with <100mW peak power, a frequency bandwidth >1THz, and up to 100ps pulsewidths (see figure), also thanks to a novel reconstruction algorithm that we call Fresnel-Limited Extraction Procedure (FLEA), yielding to a time-bandwidth product (TBP)>100, unprecedented for on chip signal measurement. Figure 1: Measurement of optical pulses’ phase and amplitude performed with our integrated FWM-X-SPIDER device, for a complex waveform of ~ 1THz bandwidth: retrieved waveform from spectra and comparison with experimentally measured FROG SHG spectrograms. Panel (I), (II) and (III) display pulses with a time-bandwidth product 5, 30 and 100 respectively. For each panel, the amplitude (a,b) and the phase (c,d) are reconstructed in the temporal and spectral domains, respectively. The red and brown lines depict the results obtained through the application of the standard (FXS-S) and our novel (FLEA) (FXS-F) phase-reconstruction algorithms on the measured spectral interferogram, respectively, while the dashed curves are the profiles extracted from the SHG-FROG measurement. In (b) the directly measured spectrum is also shown (in blue). For each panel, (e)-(f) show the numerically reconstructed FROG spectrograms for the pulse profiles retrieved from the standard and the novel phase-reconstruction algorithms, while (g) reports the SHG-FROG measurements performed to characterize the same PUT. Nature Photonics Workshop on the Future of Optical Communication,Tokyo, Oct. 2007. OFC/NOFC Workshop: Exascale Computing: Where Optics Meets Electronics,OMA Los Angeles, Mar. 2011. Walmsley, I.A. &amp; Dorrer, C., Characterization of ultrashort electromagnetic pulses. Adv. Opt. Photon. 1, 308-437 (2009). Pasquazi, A. P., et al., Sub-picosecond phase-sensitive optical pulse characterization on a chip. Nature Photon doi:10.1038/nphoton.2011.199 (2011). Foster, M.A. et al., Silicon-chip-based ultrafast optical oscilloscope. Nature 456, 81-84 (2008). Tien, E.K. Sang, X.Z. Qing, F. Song, Q. &amp; Boyraz, O., Ultrafast pulse characterization using cross phase modulation in silicon. Appl. Phys. Lett. 95, 051101 (2009).